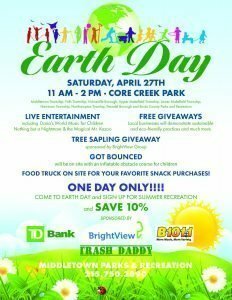 Please join us on Saturday, April 27th from 11AM-2PM at Core Creek Park to celebrate Earth Day with Middletown Township and other local businesses! There will be free giveaways, food trucks, as well as entertainment for the entire family. This is a great way to get out and learn more about our sustainable & Eco-friendly services!